Planning on getting a dog? Choosing the right dog breed for you and your family will go a long way to ensuring you spend a lifetime of happiness with your canine companion. There are many variables and options to consider when it comes to choosing a dog but perhaps the single most important decision you will make will be selecting your dog’s breed. It’s a big decision, one that will impact every member of the family including your new canine companion. The world of dogdom offers a wondrous assortment of dog breeds. The Australian National Kennel Council recognizes nearly 200 different dog breeds, offering an astounding array of shapes, sizes, temperaments and behaviors. If you’re a soon-to-be dog owner, that’s both good news and bad news. It’s good, of course, because whatever you might fancy, be it teacup cute or monstrous mastiff, there is a breed out there for you. The big question remains, however, how do you navigate your way through the bewildering assortment of options to arrive at the best breed for your situation? We recommend you start by considering what combination of the following three traits works best for you and your family. Some breeds are nervous and skittish, some are laid-back and easy going; some are wary of strangers, others are friendly toward everyone. Determining which temperament you prefer will go a long way towards narrowing your choice of breeds. A breed that tends to be a bit more high-strung, for example, will likely make a better watchdog whilst a breed with a docile temperament may be perfect if you have young children. When you are out looking at prospective family members be sure to ask the shelter staff or breeder about each breed’s temperament and what would best suit your lifestyle. If you are looking at getting a puppy ask to see the parents or an adult of the same breed, this will give you a much better idea of your four-legged friends temperament once they grow up. Dog breeds come in a wide array of sizes and this can have an impact on everything from exercise to sleeping arrangements. Do you live in apartment? Or perhaps you live in a house with a large back yard? Whilst your home can be a factor in determining the size of dog you choose you need to make sure your living situation meets all of the breeds needs. For example, just because you have lots of room doesn’t necessarily mean you should go big with your choice of breed. Remember that a really big dog will eat lots of food – and quality dog food isn’t cheap! It’s also important to note that not all traits related to a dog’s size are intuitive. For example, choosing a smaller breed because you have less space may not be the right choice as many small breeds still need lots of room to run because they are so energetic. Ironically, the Great Dane, one of the largest dog breeds, is best suited to apartment living because they have lower exercise needs and don’t require a lot of space. Make sure you are open about your living situation when talking with shelter staff and breeders. They will be able to advise you whether a particular breed is suitable for you and your family. Will your dog be living indoors? Then you probably won’t want a breed that tends to be a shaggy shedder – particularly if any family members suffer from allergies. In that case you’ll a dog with hypoallergenic coat like a Poodle or Samoyed. It’s also worth noting that whilst some breeds shed year round, others malt for only a few weeks each year. Long haired breeds, in particular require, lots of regular grooming to keep them looking their best. Before you choose a particular breed its important you know whether you have the required time each week to keep their coat well brushed and tangle free, using specific grooming products and dog brushes. Once you’ve narrowed down your choices based upon the above traits, you’ll want to consider other breed-specific traits. Some breeds, for example, are more prone to specific health problems. Hip Dysplasia, which may result in lameness, is more common in many larger breeds. Some breed-specific health problems can be screened, and individual animals certified to be free of the problem. It can be worth calling your local vet to discuss your short list of breed choices to see whether there are any particular health problems you should be asking about when you visit the animal shelter or breeder. And some breeds tend to live longer than others. The average life expectancy for dogs in general is about 12 years. But breed-specific life expectancy can range from as much as 16 to 20 years to as little as 6 to 8 years. A bit of research can tell you whether a breed you’re considering tends to be longer or shorter lived. HOW ABOUT TWO (OR MORE) IN ONE? One other option when choosing a dog breed is the ‘none of the above’ option. Mixed-breed dog or ‘Crosses’ can offer a grab bag of breed characteristics. With a mixed breed, you have the chance of getting an absolutely wonderful pet. But a mixed-breed puppy can be kind of like Forrest Gump’s box of chocolates – you don’t know for sure what you’re going to get. If you know the parentage, though, of the mixed breed puppy you’re considering, you can make certain predictions about the animal’s adult appearance and behavior based upon those of the parents. It will require a bit of effort on your part to determine the breed traits that will best suit you and your family. And you’ll need to do some homework to learn which dog breeds are most likely to offer those desired traits. But though you’re faced with an absolute multitude of choices when selecting a dog, just consider the decision process to be part of the fun of pet ownership. After all, you get to choose how your loving companion for many years to come will look and act. Welcome to the beginning of pet parenthood – a lifetime of unconditional love and warm hugs await you! Here are six dog training tips on how to walk your dog and master the dog walk. When I'm out with my dog pack, I often walk about ten dogs at a time, sometimes even off-leash if I'm in a safe area. People are amazed by this, but it's simple: the dogs see me as their pack leader. This is why dogs follow me wherever I go. 1. Walk in from of your dog. 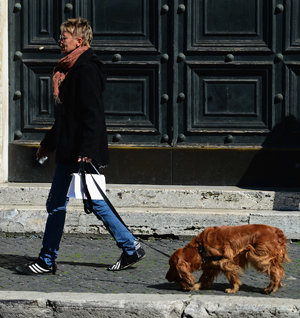 Walking in front of your dog allows you to be seen as the pack leader. Conversely, if your dog controls you on the walk, he's the pack leader. You should be the first one out the door and the first one in. Your dog should be beside or behind you during the walk. This allows you to have more control. Attaching the leash to the very top of the neck can help you more easily communicate, guide, and correct your dog. If you need additional help, consider Pack Leader collar. Always keep your dog's safety in mind when giving corections. 3. Give yourself enough time for the dog walk. Dogs, like humans, are diurnal, so taking walks in the morning is ideal. I recommend setting aside thirty minutes to a full hour. The specific needs of each dog differ. Consult your vet and keep an eye on your dog's behavior to see if his needs are being met. 4. How to reward your dog during the walk. After your dog has maintained the proper state of mind, reward him by allowing him to relieve himself and sniff around. Then you need to decide when reward time is over. It should always be less than the time spent focusing on the walk. 5. Keep leading, even after the walk. When you get home, don't stop leading. Have your dog wait patiently while you put away his leash or take off your shoes. 6. Reward your dog after the walk. By providing a meal after the walk, you have allowed your dog to "work" for food and water. And don't forget to set a good example by always picking up after your dog! Leaving a dog in your car during extreme temperatures can be dangerously life-threatening to your companion. After leaving your car closed, temperatures inside can rise 15-20 degrees within ten minutes and up to 35 degrees within thirty minutes. Without realizing the consequences, many dog owner make the mistake of leaving their dogs in a car without ventilation. So what can you do if you find a dog in distress? As of today, there are only 16 states that have laws that protect dogs in hot cars. These states are AZ, CA, IL, ME, MD, MN, NC, NV, NH, NJ, NY, ND, RI, SD, VT, and WV. Depending on the state, there are variations of the definition of the animal that can be saved, possible fines and penalties, and who is allowed to do the rescuing. Penalties in New Jersey can range from $250-$1000 while Minnesota only charges $25 for possible violations. While most states leave the rescuing to law enforcement officers and humane society agents, states such as New York allow citizens to join in on the heroics as well. 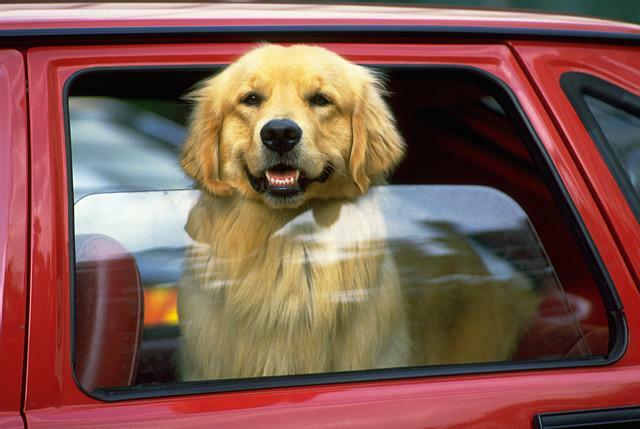 The city announced the law that if a companion animal in a trapped vehicle during extreme temperatures, a citizen can take the necessary steps to save the animal if owner of the vehicle cannot be found. This brings awareness to the attention people should have when leaving their pets in their cars, even for a short amount of time. Let's hope that pet owners will be responsible in their actions so police officers and civilians won't have to take matters into their own hands! You’re ready to get out of town for a little R & R, but you’re uncertain whether traveling with your dog in tow will provide either of those Rs. Never fear! For the well-prepared dog owner, traveling with your canine companion can be a fun and rewarding experience. Before hitting the road, plan for whether you'll be, well, hitting the road. If you'll be driving, purchase a safety harness for your dog or a sturdy carrier that can be strapped into the seatbelt. (Once you start your drive, it's best for your dog to ride in the backseat of the car.) Check your route ahead of time to locate parks or rest stops where your dog can take a bio and exercise break. If you'll be flying the friendly skies, before you book a ticket, check the airline’s website for regulations and fees when traveling with a dog. 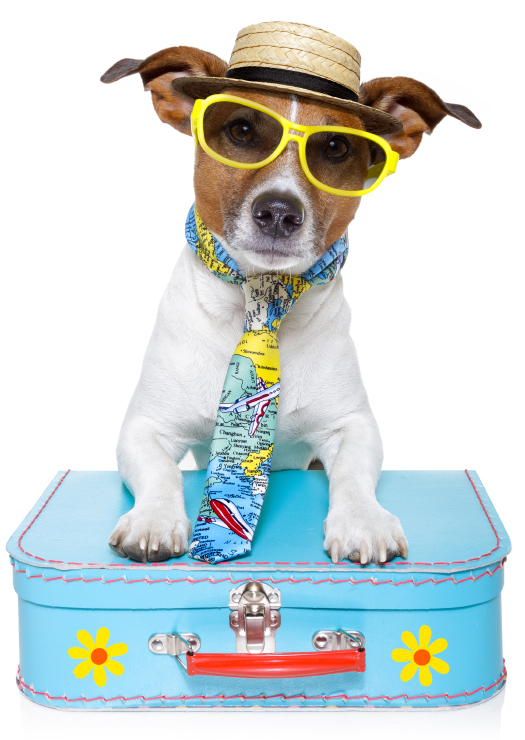 Keep in mind that most airlines require your dog to travel with a health certificate from your veterinarian. Next make sure your dog will be well accommodated at your final destination. If you'll be staying at a friend's house, ask ahead of time if your dog may join you. If so, enquire about exactly where in the house your dog will be resting his head so you can be prepared. If pets are a no-no, consider finding a kennel near your friend's home so you can still spend time with Fido while being respectful of your host’s wishes. If you'll be staying in a hotel, research hotels that allow pets before reserving a room. More and more hotels are putting out welcome mats for dogs and their owners. Once you know where you're heading and how you'll get there, it's time to make sure your dog is fit for travel. Check with your veterinarian about whether you need to make any special considerations for your dog. Depending on where you’re headed, your dog may need additional vaccinations, such as for Lyme disease. Flea, tick or heartworm prevention also are important considerations for travel, especially if your dog will be spending time outdoors. Check out Bayer HealthCare Animal Health's parasite prevention options and ask your veterinarian which one may be right for your dog. Remember that if you'll be flying with your dog, you'll likely need a health certificate from your veterinarian. Also jot down the name and phone number of a veterinarian who's located in the area of your destination. Though you may never use this information, you’ll want to have it in case of an emergency. Clean up after your dog, wherever you are. Be respectful of others’ property, be it at a hotel or at a friend’s home, especially if you want to be invited back! Try to keep to your dog’s regular schedule as much possible in terms of mealtime, sleeping patterns, etc. This will make the trip smoother for you and your pet. Have fun! This should be an enjoyable time for both of you.